101 Cambridge Street, Glasgow. G3 6RU. Tel: 01413325298. 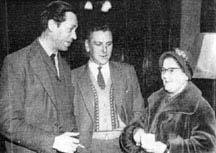 Left to right James McKell owner of the Turf Bar at the corner of Hospital Street and Rutherglen Road, Gorbals, George Ramster of the Glasgow and District Licensed Trade Defence Association and Mrs Mary Forster of Macintosh's Bar Cambridge Street. 1959. 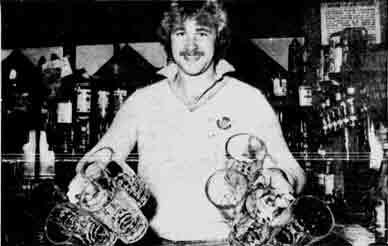 Ready for a rush of customers, Alan Rough stands by with four pint pots in each hand. 1978. The big hands of Alan Rough are more often seen pushing shots over the bar. But now the man who guards the goals for Patrick Thistle and Scotland can be seen in a different role, pushing pints over the bar. Alan wanted to learn the licensed trade, and Bill Brown, who owns Macintosh's Bar in Cambridge Street, Glasgow, stepped in. He invited Alan to work in the bar for a couple of hours a day and learn the tricks of the licensed trade. And the move was gone down well with the Macintosh's regulars, with football the top talking point in the bar.